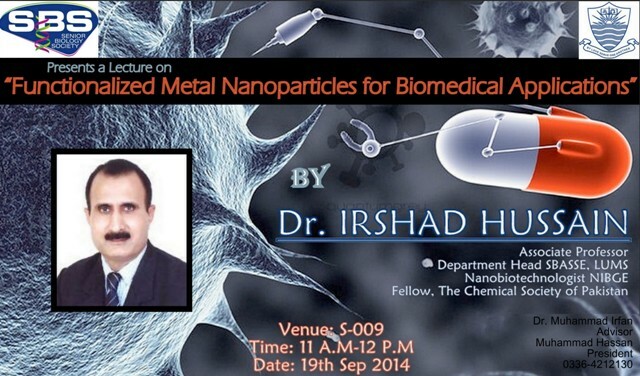 Senior Biology Society (SBS) presents a lecture on Functionalized Metal Nanoparticles for Biomedical Applications by Dr Irshad Hussain. The lecture will be held on 19 September 2014, at 11:00 am in S-009. Dr. Hussain is among the founding members of SBA School of Science and Engineering (SSE) and has played a key role in the development of the Chemistry Department at LUMS. Prior to that Dr. Hussain developed a Nanobiotech group/facility for the synthesis of metal nanoparticles and to explore their applications in biotechnology and advanced materials fabrication at National Institute for Biotechnology and Genetic Engineering (NIBGE), Faisalabad. Recently Dr.= Hussain has also been elected as the Fellow of the Chemical Society of Pakistan.